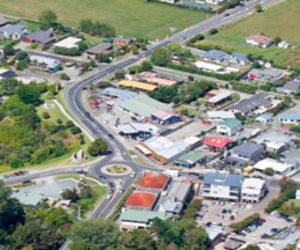 Auckland Transport has announced plans for the $62 million Matakana Link Road which will improve connections between Matakana Road and State Highway One, and help decongest the Warkworth area. The work is scheduled to start late next year and will be timed to coincide with the Puhoi to Warkworth project which will extend the four-lane Northern Motorway (SH1) 18.5km from the Johnstone’s Hill tunnels to just north of Warkworth. Warkworth and its surrounding areas will account for around 30 per cent of Auckland’s growth by 2050, with capacity for 137,000 new homes and 67,000 new jobs. Stage 1 – Will consist of two traffic lanes and one shared walking and cycling path. Stage 2 – Will be constructed in the future when traffic demand meets capacity. At that time the road will be widened to four lanes with separated walking and cycling paths on both sides.